Scarborough Archers were recently invited to Scarborough 6th Form College to introduce students to archery. Two of our Archery GB level 1 coaches, Alison and Paul, along with assistants John, Wendy and Phil explained to the group the basic history of archery and how it has evolved into an Olympic sport. The students were then told about the safety rules as laid down by Archery GB.The group were shown the correct way to handle and shoot the bow. The very enthusiastic and competitive students finished the session with a scoring round. The scores returned were very impressive, with a four way tie for first place. Finally they were tested on their new found knowledge. A very enjoyable and informative morning for all. The weather was kind for our second Soup Shoot of the winter, dry, bright and not too cold. Once again our soup maestros worked their magic, Derek’s legendary tomato and Sean’s wonderful spicy black bean soup was just the job at the interval. The winning duo of Paul Wordsworth and Stuart Sherburn showed their class with a winning score of 250. Close in second place was John Ireland and Phil Pattison with 240. Bringing up the rear (the strongest pair on the results list) were stalwarts Baz J and George R. All three pairs taking home Scarborough Archers legendary fabulous prizes. “Thank you” to Derek and Sean, Alison for sorting out the scores, and those members who helped to set up and put everything away afterwards. More than 25 members turned up for this years Christmas Fun Shoot. The Target theme this year was ‘Super Heroes’, and they were well and truly battered! We were all delighted that Santa found time to join us, and even took part in the competition! The tea, coffee, mulled wine and mince pies went down a treat, and with Wendy acting as line captain she kept the show running. The winners of the usual fabulous prizes were : Men – Peter B. and George R. Ladies – Alison H. Novices – Phil T. and Leo K. Juniors – George, Toby and Ben. The competition was followed by the Scarborough Archers Traditional Secret Santa Shoot, this was once again expertly organised by our very own ‘Arkwright’, Leigh. Santa aka John Ireland, was rewarded for his appearance with a box of biscuits. Thank you to all those members who helped to set up the targets and put everything away afterwards. It was a good turnout for the Soup Shoot despite the weather forecast. The weather was actually kind to us, as it started to rain just as we were breaking for our soup. The soup was delicious as usual thanks to the efforts of Derek and Sean. There was a slight hiccup when Derek couldn’t find a tin opener, but Peter saved the day with “ I just happen to have one”. Why would Derek want a tin opener for ‘home made soup’?? Sean’s spicey noodle soup was definitely home made and wonderfully warming. And so to the archery, our excellent recurve archers were shooting at 40cm targets, archers using wooden arrows at 80cm targets and juniors and novices at 120cm faces. With only the white ring scoring 10 points and the Blue ring scoring 5 points it wasn’t easy. However, 1st place had to be decided by a shoot off between partners Steve Carr and Debbie Simms against Neil Simms and John Ireland (both pairs scoring 270 points). The eventual winners were Steve and Debbie. Other prize winners were Derek and Emma, and George and Neil Mc. Seven members from Scarborough Archers attended the Bridlington Open Portsmouth tournament on Sunday 4th November. George, Wendy, Natasha, Steve, Phil and Neil all shot recurve in the morning session. Scoring in general was high, and although our members shot well, no one quite got into the medals. This was Steve’s first ever tournament, well done Steve. Representing the club in the afternoon shooting barebow was left in the capable hands of Pete Brown, (not shown in photo), who finished fourth in his class. Thank you to members of Archers of Bridlington and Burton Agnes who run the tournament and provided hot food and drinks for the competitors. More than 40 members and friends attended Scarborough Archers Annual Prize Presentation Night held at Scarborough South Cliff Golf Club. After sitting down to a fine meal provided by the golf club catering staff, competition winners and runners up were presented with their trophies and medals by club secretary Alison H. Trophies were awarded to winners of eight competitions run throughout the year with Juniors, Ladies and Men competing with various bow styles including recurve (Olympic), traditional English longbows and American Flat bows. A trophy was awarded to Steve C for the most ‘improved member’ of the year. A raffle was run by Ann N, Julie A and Cecily S with all monies raised going to club funds. A warm day welcomed those that came to help out at the Ayton Gala. 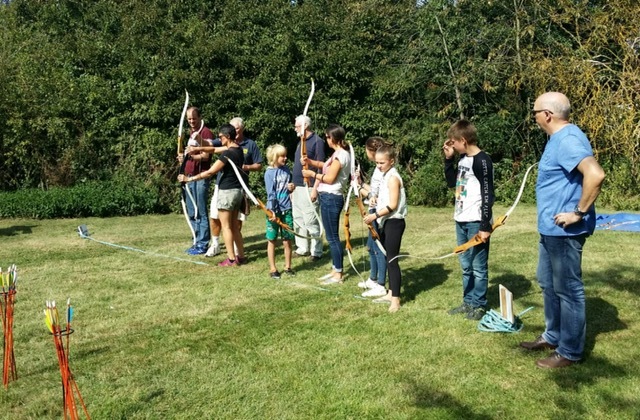 With a host of events and stalls on offer, with a steady stream of people keeping the archery lot going. Despite an early start, with a long day. The day proved successful with some extra money going into coffers, for the club. With the winter shooting times coming into effect soon, this will be be one of our last try out shoots of the year. Twenty two members turned out for Scarborough Archers first Friday Night Darts Competition. Competitors were divided dependant on the type of arrows they were using ie wood or other. Such was the success, we’ll probably make it a regular event. Prizes were awarded for highest score, lowest score and bulls eyes. After 3 dozen arrows were completed prizes were awarded to Juniors – George, Toby, Dylan and Ben. Novices – George, Richard, Ann and Peter. Big boys and Girls – Derek, Leigh, Lynn, Sean and Emma. The annual Roger Greaves trophy and BBQ this year was held on Friday evening 3rd August. 28 members took part in the competition which was ‘Darts’. After the first elimination round 8 seniors and 3 juniors went forward into round 2. The final round was a shootout between Steve Carr and Bruce McKenna for the seniors and Emily and Dillon for the juniors. After a closely fought battle, Emily emerged as junior trophy winner with a fantastic score of 237. With a score of 196 Steve managed to bag the senior trophy from Bruce. Medals were awarded to Steve, Emily, Bruce, Dillon and Ben. The competition was followed by the BBQ enjoyed by the competitors and guests. Many thanks to all those who turned up, took part and helped out. Once again the Scarborough Archers, had a meal out to Saba Thai Restaurant. Enjoyed by 20+ members. Despite the mix up in some members thinking they had to learn Thai beforehand, to properly understand the menu. Everyone enjoyed their meals, although there was some debate on the spicy rating scales. Once again, thanks go to Derek for organising and arranging everything, and his expertly planned spreadsheet, making sure everyone got their correct meals. Thanks also goes to Saba for managing to flawlessly manage 20+ hungry people. Afterwards we retired to the casino for a nightcap and a friendly chat.